(CNN) -- Rapper T.I., who was sentenced to a 366-day prison sentence in March, reported Tuesday to a federal prison complex in Forrest City, Arkansas, according to CNN affiliate WSB-TV. T.I., left, performed to a packed crowd Sunday, days before he was to start a prison term. The rapper -- whose real name is Clifford Harris Jr. -- was required to be at the prison before noon local time to begin serving his sentence on federal weapons charges. According to news reports, officers from Forrest City and the prison set up a roadblock along Arkansas Highway 1 about one-tenth of a mile from the complex. Reporters were not allowed any closer to the prison. T.I. threw himself a going-away party Sunday night at Philips Arena in Atlanta, Georgia, before a packed house. During Sunday's concert -- called "T.I. 's Final Goodbye Bash" -- the 28-year-old Grammy winner reiterated a message that's become familiar in recent weeks: He wants others to learn from his mistakes. "I'm doing the best I can to get out there, man, and put something positive on these young kids, man," T.I. said during the show. "I try my best. I need y'all help, though." 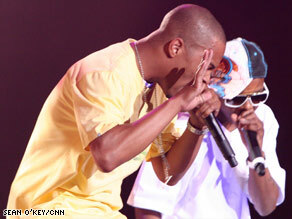 The rapper played to a sell-out crowd of 16,000 people, said Kenan Woods, a spokesman for the arena. T.I. played through much of his catalog, including the hits "Whatever You Like," "Live Your Life" and the Grammy-winning "Swagga Like Us," Woods said. At times in the show, Harris was joined on stage by fellow rapper Soulja Boy and by his five children and mother, Woods said. T.I. was sentenced in March on weapons charges related to purchasing machine guns and silencers. In addition to serving prison time, T.I. was placed on house arrest, was given community service and was ordered to pay a $100,300 fine. What will happen to T.I. 's career? Though he had been in legal trouble before, Harris' current situation began when he was arrested just hours before he was to perform at the BET Hip-Hop Awards in Atlanta. The rapper had provided a bodyguard with $12,000 to buy weapons. Harris was not permitted to own any guns, however, because he was convicted in 1998 on felony drug charges -- possession of crack cocaine with intent to distribute -- in Cobb County, in suburban Atlanta. After his arrest, he entered a plea agreement, which federal authorities called unique because it allowed the rapper to remain out of prison for a year while he performed community service. Harris has already left a strong mark on the hip-hop genre, music experts told CNN, which should position his career well when he is released. Harris had been named to the Forbes list of top-earning rappers, making an estimated $16 million in 2006. Some music industry observers have said T.I. 's prison term will only make him more popular. "I think that if anything, it will gain him more fans and actually support his fan base, because he's talked about making a mistake," Emil Wilbekin, editor in chief of Giant Magazine, told CNN. "He's talked about taking care of the error of his ways." The Atlanta rapper has expressed remorse for the situation. "I would like to say thank you to some and apologize to others," he said at his sentencing in March. "In my life, I have been placed in the worst-case scenario and had to make the best of it." In a March interview with CNN's T.J. Holmes, Harris said he no longer felt like he needed to carry weapons to protect himself. He said people should not idolize him for what he's gone through, but should take note of the fact that he has taken responsibility for his actions. "You shouldn't take the things that I've gone through, and the negative parts of my life, and admire me for that. If anything, admire me for how I've accepted responsibility for the part I played in placing myself in these situations, and what I've done to recover from it," Harris said. Harris has been the subject of an MTV reality show, "T.I. 's Road to Redemption," in the lead-up to the prison term.